NEWINGTON - First varsity starts under the Friday night lights can often be taunting. Outside of the game on the football field, there’s the crowd, the atmosphere and sometimes a mixture of emotions. But for Nick Pestrichello, it couldn’t have gone much smoother. Newington’s sophomore quarterback made quite the debut during the team’s home opener Friday evening. Under Pestrichello’s direction, the Indians were able to cruise to an easy 41-0 shutout victory over Amistad. On the field, Pestrichello didn’t look like the rookie that he was, even though he’s fairly new to the quarterback role. It was just last year he switched from the running back position. Pestrichello was more than comfortable against the Wolves when he connected on 7 of his 10 passes for 70 yards and two touchdowns. 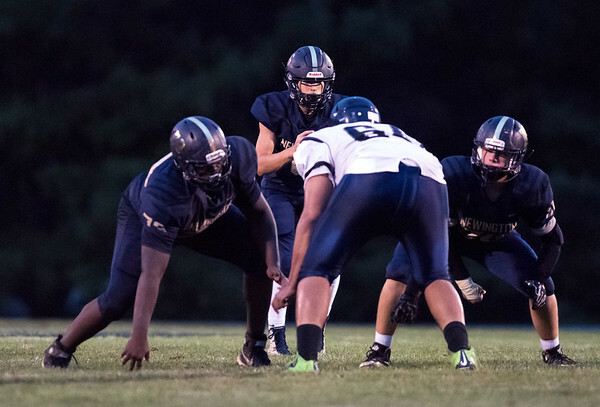 Pestrichello started football at the age of five with Newington’s touch-football program and has been playing ever since. Although he wasn’t the quarterback back then, his talent and knowledge of the sport still showed on the field, something that’s always an evolving process. But Friday was a good start when Pestrichello led five of the team’s six scoring drives. Before the game, Newington head coach Jason Pace pulled Pestrichello off to the side to ease his jitters, but it was in that moment when Pace realized Pestrichello was ready. He was able to make the right calls most of the night. Whether it was passing or handing it off to Newington tailback Dylan Nees-fair, Pestrichello did what he had to do to get the offense going. In the first five minutes of Friday’s game, Pestrichello looked for wide receiver Izayah Ciarcia and threw it deep. Ciarcia made the 18-yard catch as he dove into the end zone to set the tone for the rest of the game. It wasn’t too much later with Pestrichello connected with Newington tight end Julian Ortiz for a 13-yard passing touchdown. Pestrichello will be an important piece to Newington’s puzzle over the next few years. And although he is just a sophomore, the Indians have nothing but confidence in the signal caller’s ability. The best part is, he still has plenty of room to grow. Posted in New Britain Herald, Newington on Monday, 10 September 2018 19:30. Updated: Monday, 10 September 2018 20:12.